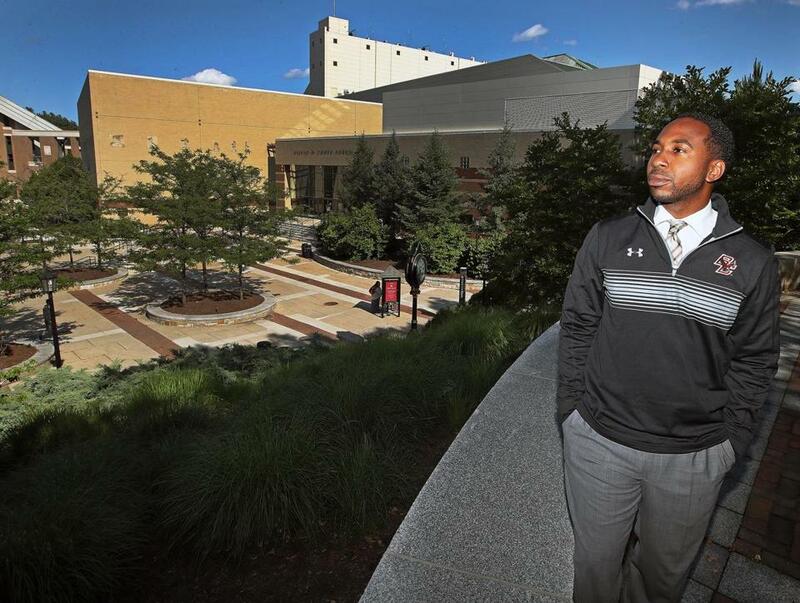 “Diversity is important to making us better,” said BC athletic director Martin Jarmond. 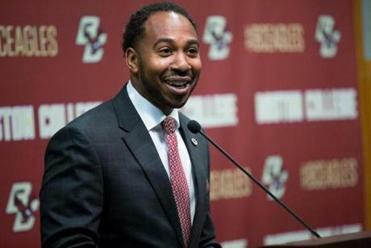 It took just a matter of days for Martin Jarmond to get a sense of exactly how he fits in as the new athletic director at Boston College and the fresh face of a program in need of new life. His first week in the office, football coach Steve Addazio had a recruit he wanted Jarmond to meet. The player came up to Boston with his father to get a feel for the program, but also a sense of the city. One of Addazio’s assistants gave Jarmond a heads-up that the father had some worries he wanted to address. “Their concern, what the recruiting guy told me, was my son being in Boston racially,” Jarmond said. Addazio made a quick introduction, then he left them alone with Jarmond. In private, the father was candid. Vaughn Williams and Jocelyn Fisher Gates will work closely with new AD Martin Jarmond. To Jarmond, the exchange was symbolic in a way. At 37 years old, Jarmond is the youngest athletic director at any school in a Power 5 conference. He is also one of just 14 black athletic directors among the 128 Football Bowl Subdivision schools and the first black athletic director in BC history. To Jarmond, those aren’t simply talking points, they’re strengths vital to reviving a BC program that’s had a hard fall from grace over the past 10 years. For an athletic department in need of a jolt, Jarmond is a walking energy drink. He takes his meetings in the mornings (with a cup of oolong tea) and makes decisions in the afternoon. He’s suit-and-tie, but not starched. He’ll have a Miles Davis playlist cued, but is fully fluent in J. Cole. He is by no means bashful. At his introductory press conference in April, Fox 25 reporter Tom Leyden asked about his vision for BC and slid in the fact that he was an alum. When Jarmond quipped, “I’m going to ask you for money, Tom,” it may have sounded like a joke, but it wasn’t. “He actually ended up making a donation,” Jarmond said. He made his name as a highly skilled fund-raiser for two of college sports’ most high-profile programs, Michigan State and Ohio State, but he made a career for himself by building relationships. It’s been a part of his makeup since he was a child. Johnson and Jarmond grew up together in Fayetteville, N.C., playing basketball in each other’s yards. When Jarmond went to community service events for the youth leadership “Jack and Jill” program, he made sure Johnson went with him. “Just talking with him and hanging with him got me to see a different perspective on life,” Johnson said. He flashed the same traits on the court. His journey from a walk-on at UNC Wilmington to a two-time captain who helped the Seahawks reach the NCAA Tournament in 2000 seems like a fairy tale, but it was actually an early example of knowing how he could add value. It was also the spark that started him on his path in athletic administration. Jerry Wainwright, UNC Wilmington’s head coach at the time, remembered the first time Jarmond walked into his office. Wainwright had scouted Jarmond’s high school team because it was a powerhouse, but Jarmond wasn’t one of the players he targeted. When Jarmond said he wanted to walk-on, Wainwright was skeptical. “I had to earn everything,” he said. He was a terrorizing on-ball defender. He got the team into its sets. He put scorers in position to do what they do best. He couldn’t shoot, and you would rarely catch him trying to. More than anything, he motivated. “He had a knack for going on the practice floor, I would say to him sometimes, ‘Hey look, this guy is down.’ I said, ‘You make sure he’s not a dog today. You make sure you pick him up all day, OK?’ I could say things like that to him, and he was right on it. Jarmond’s junior year, Wainwright pulled him into his office and asked him a question no 21-year-old’s quite sure how to answer. “I brought him in, and I said, ‘What are you going to do when this is all done?’ ” Wainwright remembered. Jarmond had never heard of it. Jarmond’s charisma, people skills, and work ethic earned him the nickname “The Mayor” in the locker room. “I always told him he could sell ice to an eskimo,” Wainwright said. 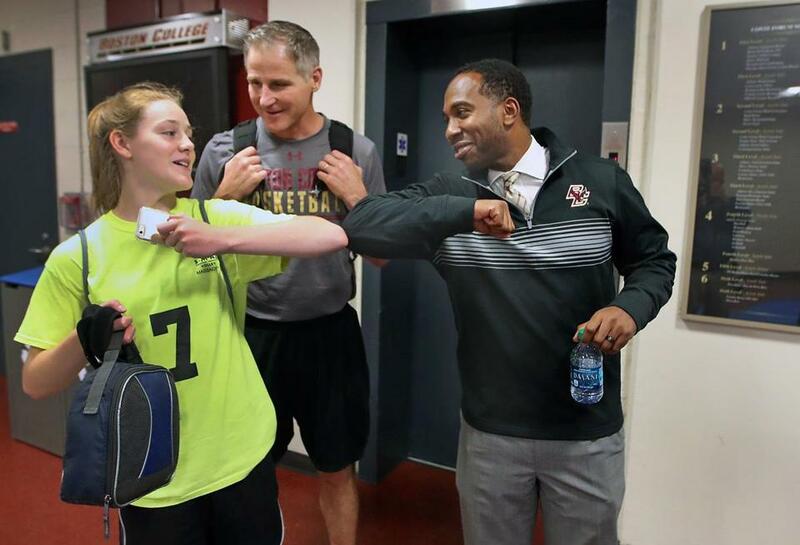 BC athletic director Martin Jarmond, with women’s basketball coach Erik Johnson and Johnson’s daughter, Avery, is known for his people skills. “I always told him he could sell ice to an eskimo,” said Jarmond’s former college basketball coach, Jerry Wainwright. Wainwright mentioned to Jarmond that there was a focus in college sports on diversity in athletic departments around the country and pointed him toward the John McLendon Minority Postgraduate Scholarship Foundation, offered by the National Association of Directors of Athletics to minorities pursuing degrees in athletic administration. They took care of the paperwork, Jarmond landed the scholarship, and went on to get a master’s in both business administration and sports administration from Ohio University. It didn’t take long for Jarmond to realize he had found his calling. He was hired as Michigan State’s assistant athletic director of development in 2005 and was promoted to director in a year. He helped the athletic department raise more than $126 million. His job was raising money, but his skill was still connecting with people. Jarmond was a 25-year-old moving through the ranks at Michigan State, running on ambition and a “nothing’s given” mind-set, when he first bumped into Ohio State athletic director Gene Smith. They both happened to be in one of Ohio State’s suites during a Spartans-Buckeyes football game. Jarmond knew who Smith was, but he didn’t know how much of a role Smith would play in his future. Even when Smith hired him as Ohio State’s associate athletic director for development in 2009, Jarmond didn’t necessarily assume Smith would take him under his wing. The way to earn Smith’s respect, in Jarmond’s mind, was to simply do the work. His first year on the job, he never set up any one-on-one meetings with Smith to talk about his future. Instead, once a week, he scheduled a meeting to talk strategy. “I wanted to prove to him for a year, I’m the real deal, and I want to grow, and I want to get better,” Jarmond said. What he didn’t realize was that Smith already saw his potential beyond what he was doing at Ohio State. Smith made it a point to expose Jarmond to every facet of Ohio State’s operation, from event management to IT. In time, Jarmond had firsthand experience with how the business ran, how to oversee all of the school’s sports, how to manage compliance laws, how to evaluate employees, how to go about hiring, how to go about firing. “All those things, as he went through the organization, I wanted to make sure that he experienced those things because when you become an athletic director, you have to be able to see it all,” Smith said. It is by no means lost on Jarmond that he is one of a few minorities in a leadership position in the athletic department of an FBS program. As of last fall, 85.9 percent of athletic directors were white, according to The Institute for Diversity and Ethics in Sport. Of 128 athletic directors around the country, just 13 (10.2 percent) were African-American. BC has its own battles to overcome with diversity. Despite an enrollment of around 14,000 students, African-Americans, Asians, and Hispanics make up just 30 percent of the student body, according to its most recent Higher Education Opportunity Act disclosure. African-Americans make up just 4 percent. In the athletic department, all 31 head coaches are white. While the school’s board of trustees has had minority representation since its founding in 1972, last year was the first time the board had no African-American members. That was rectified last June when two African-American members were hired. In September, the NCAA encouraged its 1,200 institutions to sign its Pledge and Commitment to Promoting Diversity and Gender Equity in Intercollegiate Athletics. BC chose not to sign it, citing internal diversity initiatives while pointing to the pledge’s toothlessness (it is non-binding). Instead, the school pointed to the hiring of Jarmond plus the appointing of two African-American trustees last June as steps taken to address diversity. 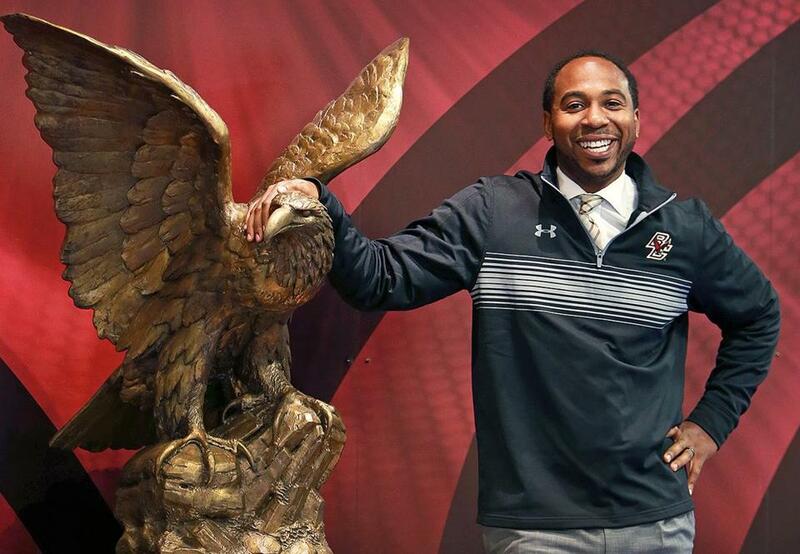 Martin Jarmond took over a BC athletic program in which all 31 head coaches are white. “Our students are diverse, and we should reflect that,” said the new AD. Jarmond leaned on Smith’s experience when he was weighing the decision to come to BC. Smith was one of just two black athletic directors in major college sports when he was hired by Eastern Michigan in 1986. He was Ohio State’s first black athletic director. He knew what was in front of Jarmond because he had walked the same path. “I’ve been the first African-American athletic director in a number of situations,” Smith said. “I’m kind of the old head in the business. I’ve always told the people that I’ve worked with like Martin, don’t even think about that. The color of his skin won’t be a focal point, but the makeup of the department will be. Jarmond’s office is still pretty much a blank canvas. His desktop is clear save for a framed picture of his daughter Scarlett. He just had new carpet laid, and a wall-size TV mounted. In time, he’ll have it decorated to his liking with visions of using the suite to host donors. But right now, the space is still relatively empty. But his inbox is full. But the most common sentiment is how much of an uphill battle Jarmond has ahead of him. “You know what — and I’m going to say this — a common thing I’m hearing from fans and donors is, ‘You’ve got a tough job on your hands,’ ” Jarmond said. Jarmond isn’t going in naive. What also struck Jarmond about the e-mails was the optimism he received. Jarmond was able to meet BC hoops legend Bill Curley at a local charity event in June. Curley left their conversation impressed. But if the biggest challenge is getting an embattled fan base to buy in, Jarmond’s already started to chip away at that.